GulfStar Advises Rose Machine in the Sale to Ellwood Group, Inc.
Rose Machine and Fab., Inc. (Rose Machine or the “Company”) is a leading provider of rough, semi-finish and finish machine services, supplying mission critical parts to the oilfield, midstream oil and gas, petrochemical and related industries. The Company, located in Houston, operates more than 75 CNC machines out of its 110,000 square foot facility and employs approximately 125 people. Rose Machine was established in 1995 by Richard Rose, a self-made and self-taught entrepreneur. Richard started the business when a former customer (from a previous business) expressed the need to find a good machine shop. Richard found the necessary machinery, read the manuals and began machining parts. Since commencing operations, Rose Machine experienced rapid growth, offering what their competitors could not, a single-source solution for start-to-finish machining of large parts weighing up to 125 tons. This large format machining capacity coupled with technical expertise and reliable service allowed Rose Machine to become one of the largest machine shops in Texas. The Company serves the largest oilfield manufacturers, petrochemical plants and equipment manufacturers in the industry. The number one goal of Rose was to maximize value without disrupting the Company’s relationship with either its employees or its critical customers by having inaccurate rumors in the market place. GulfStar was able to present the Rose package and keep our anonymity at the same time. In preparing the Company for the market, GulfStar identified two principal transactional challenges. First, Rose Machine had added a key oilfield customer in the years leading up to the transaction. This customer had become the Company’s largest customer, accounting for a significant portion of its current revenue. GulfStar effectively communicated the strength of the relationship with this customer and the significant backlog of orders from the customer, minimizing any perceived concentration risks associated with having large accounts. Additionally, Rose Machine had invested significant capital in the last four years to double its facilities twice and add several new machines. The full economic benefit of these expenditures was not yet reflected in the earnings of the business. By demonstrating the run-rate impact of these new machines, GulfStar communicated the potential earnings of the Company and the need to receive value for these recent investments for Rose Machine. 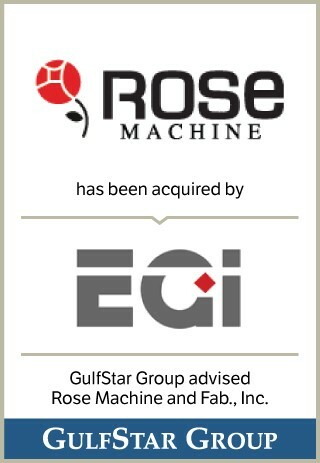 GulfStar ran a competitive, highly confidential auction process and ultimately assisted Mr. Rose in selecting Ellwood Group, Inc. (“EGI”), headquartered in Ellwood City, Pennsylvania, as the buyer for Rose Machine. EGI produces engineered, heavy metal sections for capital specialty equipment manufacturers in the United States and around the world. As a strategic buyer, EGI was able to offer Rose Machine not only the highest value from a transactional perspective, but also the support and industry experience that would help take the Company to the next level and ensure a smooth transition for the Company’s employees and customers. With this partnership, Rose Machine and EGI are able to leverage their facilities and assets to provide an even more robust product offering for their clients. Richard Rose will continue to run the operations of the business and has joined EGI as President of Ellwood Rose Machine.